A somewhat disgusted Morecambe looked to the audience, composed himself and grabbed “Mr Preview” by the lapels. It was pure comedy gold, and at the time watched by millions of viewers on the iconic Morecambe & Wise Christmas Show. It’s a moment that has stood the test of time, and to this day, whenever Previn is in the UK, people remind him of it with fondness. Eric Morecambe was a comedy genius, taken from us far too young. Born Eric Bartholemew in the Lancashire seaside town of Morecambe, he chose to take its name and went on to be one of the greatest comedians the World has ever seen. It was the classic double act with Ernie Wise, in fact, watch Wise’s contribution to the famous Previn sketch, no words, just body language, quite brilliant! A statue sits on Morecambe sea front of Eric, in fact it’s the number one attraction in the town according to Trip Adviser, but have a guess what’s at number two? 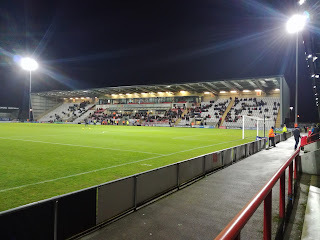 It’s the Globe Arena, the home of Morecambe Football Club, and I’m not sure if that says more about the town or about the football club. 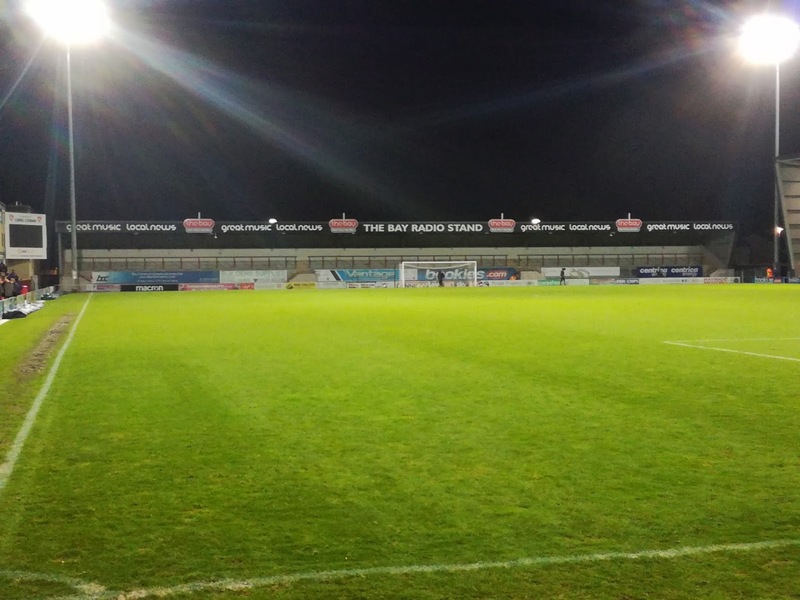 The story of Morecambe Football Club for many followers of the game is quite an unlikely one. I first saw them play back in the early Eighties at the likes of Matlock Town and Burton Albion in the Northern Premier League. They were an average side, but fortunes improved as we moved into the Nineties and a side with a front pairing of John Coleman and Jim McCluskie, they finished runners up in the 1994-95 season and with it came promotion to the Conference. Morecambe more than punched their weight in the Conference, despite not being one of the bigger fishes, and after a couple of unsuccessful skirmishes in the Play Off’s, they made it third time lucky in 2006-07 when they beat Exeter City 2-1 at Wembley. So, little old Morecambe were a Football League club, two promotions without winning a league and suddenly they were part of the 92 elite. It was a remarkable rise of a club, and it almost didn’t stop there. In their third season they reached the League Two Play Off’s but fell to Dagenham & Redbridge in the semi finals. In the past seven seasons since, in all but one of the campaigns they’ve finished in the bottom half of the table. Whereas again this season they sat in the bottom four prior to the game with Yeovil Town. 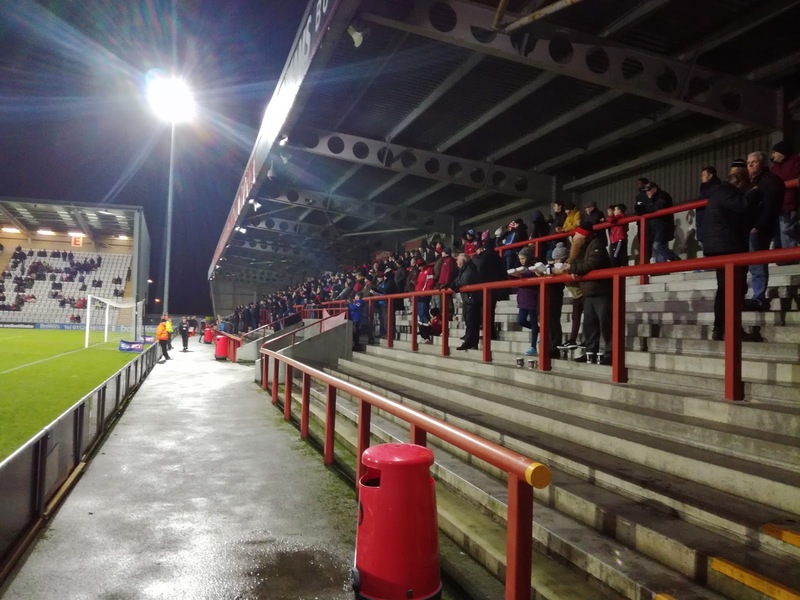 Morecambe are not hugely well supported, one crowd this season in the League has been below the thousand mark, whereas 1,500 is the average, the lowest in the entire 92. I’m not being disparaging to the club, far from it, I’m pointing out that to just be in the Football League and survive year in, year out, with the support they get, is a phenomenal achievement. 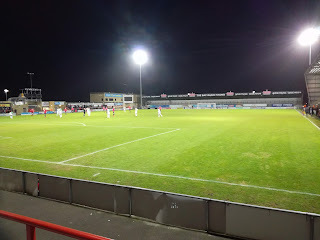 I first went to Morecambe in the 2005-06 season to see them play Forest Green Rovers at the old Christie Park ground, but within five years they had left the old stadium and moved to a spanking new one called the Globe Arena, and it’s taken until now for me to get round to paying it a visit. We always like to have some time away between Christmas and New Year, centred around football, and the most viable option this time was to base ourselves in Lancaster, take in Morecambe on the Friday and then head up to watch Carlisle United on the Saturday. When I say take in Morecambe, only myself was going to that one, Mrs H and Master H had theatre tickets, so it was a short hop on the train and a steady fifteen minute walk through the housing estate to get to the ground. A couple of pre-match liveners were taken in JB’s Bar (named after long serving Manager Jim Bentley) before taking up a position on the terraces behind the goal. The ground reminds me so much of the old Christie Park, with the main stand down one side, covered terraces behind both goals and a narrow open terrace down the side opposite the stand. It was as though the Globe Arena was built as a tribute to the old stadium. The crowd was pretty sparse, just over a thousand, with somewhere between 50 and 100 travelling the mammoth distance from the West Country. 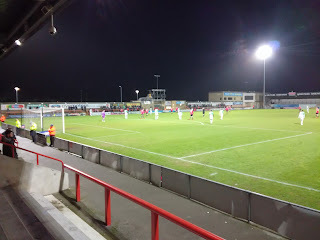 Considering the recent weather though it was quite a mild evening and it boded well for the football. It didn’t bode well for the Shrimps at half time though, Yeovil had gone into a 2-0 lead thanks to a first minute goal from Jake Gray and a seventeenth minute strike from Otis Khan. The hosts were all at sea, the natives were not happy. The second half was one of the most entertaining halves of football you could ever see, or should I say the last twenty minutes. 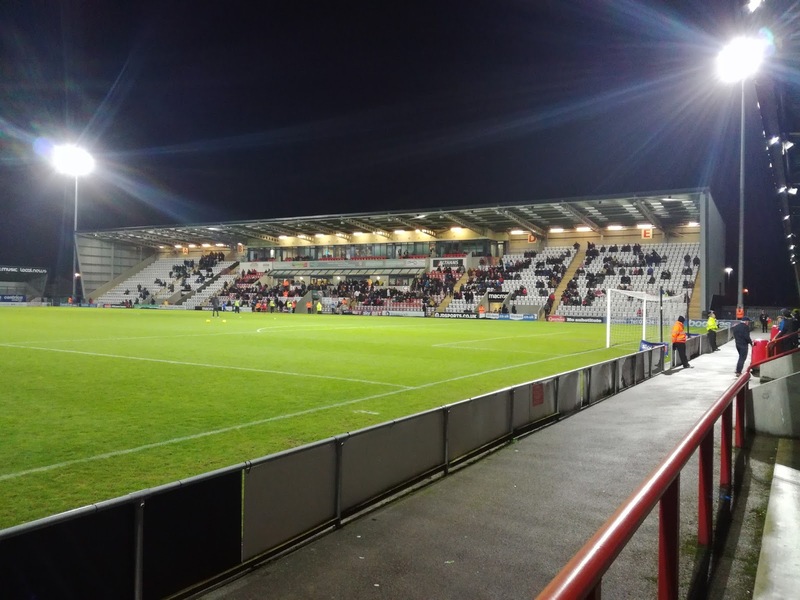 A revitalised Morecambe pulled a goal back through Vadaine Oliver in the 72nd minute, and then on the 79th minute Callum Lang grabbed the equaliser. Yeovil went straight back up the other end and re-took the lead through Omar Sowunmi only for Lang to notch his second almost directly from the re-start to make it 3-3. It was the 85th minute, which way was this game going to swing? In the 92nd minute, the evergreen Kevin Ellison produced a brilliant looping header for the hosts which arced over the keeper and into the net. Off came Ellison’s shirt and up to the barriers behind the goal he ran. The fans came the opposite way and we had tremendous scenes of celebration with players in the crowd, the crowd on the pitch, it was brilliant to see. And that was how it ended, a fantastic but unlikely victory for the Shrimps based on the first half performance. The home fans sang the Morecambe & Wise classic as the game came to a close “Bring Me Sunshine”, it seemed very apt. Eric will no doubt have been looking down and smiling to himself at this result, the Shrimps played all the right notes in the end, but, not necessarily in the right order…….